Welcome to SCUBA News - I hope you enjoy it. This month we're delighted to report that SCUBA News now has over 10000 followers on Twitter! Thank you everyone. If you want to join us on Twitter we're @SCUBANews - we look forward to meeting you there. Palau offers world-class diving with sheer drop-offs, caves and an exuberance of marine life. Indeed, its Blue Corner Wall dive is currently ranked number one in the Top Ten Dives of the World list. Famous for sharks, find when you'll see the most. The Chrisoula K, in the Red Sea, is a lovely wreck with some beautiful soft corals. A new photo gallery of the Chrisoula K is now on our Google+ page, and details of the wreck on the SCUBA Travel web site. For the first time, Britain’s Royal Mail has issued stamps championing an environmental issue – and that issue is sustainable fishing. Overfishing has long been a problem – policy-makers don’t seem to understand if you take more fish out of the sea than can be replaced then you will run out. One way things might change is by consumers voting with their purses and choosing to buy only fish that can be caught sustainably. Research has revealed though that little is known by the public about which fish are in trouble and which we can eat. Half of the species illustrated on the stamps are fish that are at risk in European waters: Common Skate; Spiny Dogfish (Rock Salmon); Wolffish; Sturgeon and Conger Eel. The other half are species from what are probably sustainable populations and suitable alternatives: Herring; Red Gurnard; Dab; Pouting and Cornish Sardine. The largest skate found in European waters, with females growing up to 285 cm. They can live up to 100 years! Previously widespread – as the name implies – they are now extinct in the Mediterranean and greatly reduced in range around Britain. Wolffish live on the seabed. They do not reproduce until they are 8 to 10 years old. Modern fishing methods have severely reduced wolffish numbers, not just by catching the fish but also by destroying their habitat and breeding grounds with intensive, repeated bottom trawling. This massive fish grows to almost 3 m (10 ft) long, the females often being bigger than the males. Congers breed only once in their lives, commonly when they reach 5 years old, after which they die. As they breed only once, just about all eels which are caught in fishing nets are juveniles which have not yet reached spawning age. They only become sexually mature during the journey to the spawning areas. More commonly known in the fishmongers as Rock Salmon, the spiny dogfish is critically endangered. It is a long-lived, slow-growing and late-maturing species and thus particularly vulnerable to fishing. Pregnancy lasts between 18 and 22 months, one of the longest recorded for any vertebrate, and they give birth to live young. Older females produce 10 to 21 pups, but younger ones (who are smaller than 1 m) produce less. Called Pouting on the stamp but known to divers as Bib. A member of the cod family, matures at just 1 to 2 years and around 23 cm long. Pouting is considered an “under-utilised species”: the ones that fishermen don’t catch their full quota of; or they catch them but then discard the fish because no one wants to buy them. Can be used in recipes specifying white fish. Herring is a familiar fish. Its sustainability depends on the methods of the fishery catching it. Look for certification from the Marine Stewardship Council (MSC) to show that the Herring were caught responsibly. Gurnards are a non-quota species so are often discarded due to low market demand. If we eat these it will stop fish being wasted in this way. Avoid eating immature fish – those less than 25cm – and fresh fish caught in summer during the spawning season. Look for MSC certified fish with the Blue tick logo on the package. The most sustainable sardine fishery are the Cornish boats using traditional pilchard drift nets. Sardines and pilchards are the same fish, the larger fish are known and pilchards and the smaller as sardines. Dab is one of the most abundant fish in the North Sea and can be eaten instead of other flat fish like plaice. The International Union for Conservation of Nature has released a global strategy to prevent extinction and promote recovery of sawfishes, which are the most endangered fish in the ocean. Divers could be armed with a device that fires big intense bubbles and beaches could be enveloped with bubble curtains to scare off big sharks as WA scientists report some success in tests of innovative shark deterrents. Red tides are toxic and can cause paralytic shellfish poisoning. This year researchers are using four robotic instruments that measure bloom concentration and toxins and provide near real-time data on toxic algae which they transmit to shore. New research reveals how the algae behind red tide thoroughly disables - but doesn't - kill other species of algae. 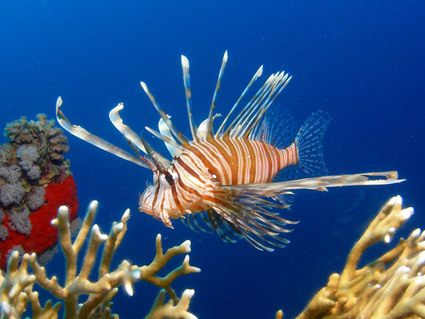 A lionfish wiggles its fins to invite another to join it in a hunt. They then share the food evenly, unheard of in other animals. Eighteen countries are underwriting the 'plunder of the high seas' on an industrial scale through government hand-outs to fishing fleets, an international commission has found. Fish living in deep waters on the continental slope around the UK play a vital role carrying carbon from the surface to the seafloor. They eat fish that live a mid-depths but migrate daily to the surface. Are tiny plastic pieces rearranging microscopic ocean life? New study shows that the tiny bits of plastic themselves are acting as novel habitats for microscopic organisms, potentially moving those organisms around in ways they couldn't have managed before. WWF is urging the New Zealand government to heed the advice of the world's leading scientists and ensure the survival of the critically endangered Maui's dolphin through the full protection of the coastline they inhabit.